via: Independent It's not a year since Dexter, everyone's favourite serial killer with a skewed moral code, failed to meet his maker in fitting context and found himself instead logging the forests of the Pacific North West under a bearded new guise. 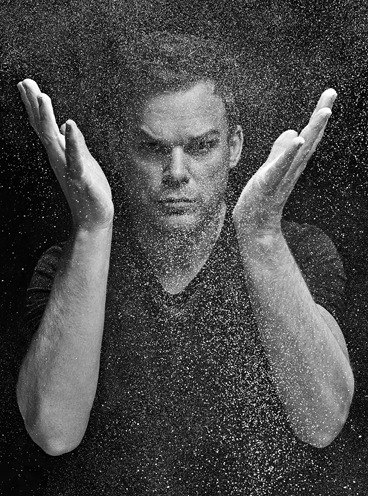 But surely Michael C Hall's homicidal fan requests would have quelled, even just a smidge. "No no," softly chuckles the actor, whose speech pattern is intercepted by so many drawn-out pauses, Insider suspects the line's gone dead on several occasions. "They've intensified if anything. And I'm more than happy to take pictures with people but it's the stuff beyond that." "Yes! And I turn them down if they want me to actually act like I'm killing them. 'No, no, not unless you pay me,' I say." Read the full article after the jump! For eight seasons (perhaps three too long?) Hall majestically embodied the charming, ferocious sociopath, a blood spatter analyst with a double existence as a 'existential leveller', a vigilante killer of killers who escaped between the cracks of a flawed judicial system. Violent yet also remarkably docile, it was the role of a lifetime for the former Six Feet Under star, who'd previously crossed the primetime boundaries as sexually suppressed undertaker, David Fisher. Hall admits however, after another long, yawning silent break in the conversation, he struggled with Dexter's ultimate intention. "Particularly a character like Dexter with the twists and turns in the story, it becomes difficult to wrap your head around. "I do know in season three, I couldn't wrap my head around the fact that Dexter was getting married and having a child and making all these commitments. His behaviours were much more contradictory than I was able to understand. But that's a part of the story." "I didn't say that I wasn't happy that they didn't kill him off," he says, resolving his purports. "I'm just aware that many people are expressing that they aren't. "So many ways they could have ended it. I'm sad that this didn't resonate with more people as an emotionally satisfying ending but I find it plausible. Undeniably, he's still alive and there is an open-ended nature to that..."
He anticipates my predictable response, " ... and yes, possibly a desire to revisit the character at some point in the story but there are no specific plans to do that." Speaking from his temporary abode in Manhattan while he performs on Broadway in The Realistic Joneses alongside Marisa Tomei and Toni Collette, the 43-year-old lacks that simmering, frenzied desire for assurance, a modus operandi for his glittering contemporaries. There were rumblings of negotiations for several roles in The Dark Knight franchise; a mooted revamp of Marvel's visually impaired comic hero, Daredevil and a call for the Fantastic Four reboot, now proceeding with Kate Mara, Toby Kebbell and Miles Teller. The North Carolina native has instead maintained a subdued post-Dexter career, decidedly inconspicuous. First came the quiet staccato of Kill Your Darlings, as real-life murder victim David Kammerer, killed by the hands of Lucien Carr, one of the founding fathers of the Beatnik generation. Michael's portentous support was overshadowed by the loquaciousness of Dane De Haan's Carr and Daniel Radcliffe's spiffy, rattled Allen Ginsberg. His central turn however, as an ordinary man in a jam in Jim Mickle's Cold in July offers an understated taste of what the actor can deliver. Though it doesn't grant him full flight. As Richard Dane, he's a placid, unfulfilled family man whose life shatters when he shoots and kills an intruder in his home. The act results in retribution from the inhabitants of small town eighties' Texas. The distrust is palpable. "He's a guy whose life has happened to him, and in a way, the action represents an opportunity for him to happen to life." The recurrent themes of death and the dark recesses of the soul; not a vast distance from his previous incarnations. "As far as the Dexter prism goes, it's dealing with similar themes, murder and violence from a very different perspective. I enjoyed playing someone who kills without wanting to or needing to." A former schoolboy crush was awakened by the presence of Sonny Crockett on set. "Don Johnson was the coolest guy in the world when I was in high school but we never talked about Miami Vice," he says. "He has amazing stories and we laughed at lot. "And if Dexter ever shows up on a TV show, I did think he could meet Crockett in some cringy private detective crossover. Growing up an only child after his older sister passed away in infancy, he also lost his father to cancer when only 11 years old. Then Michael himself developed Hodgkin's Lymphoma during shooting for the fourth series of Dexter. His logic and general stance on life is absolutely understandable. He went public when accepting his Golden Globe for Actor in a TV series drama, wearing a black knitted cap, at the start of 2010. The ripples have swelled and danced since. "I really hadn't appreciated that that would mean so much to so many people. "I felt compelled to explain why I didn't have any eyebrows and I'm glad I did." A figure of inspiration for so many, the now cured actor finds himself happily speaking about his experiences almost daily. "I have people approach me all the time to let me know that they or somebody they love is struggling with or has survived or has succumbed to... provided them with some strength or comfort or solidarity, that's very gratifying." He speaks about finishing off his Broadway play, before skating round the bare details of a 'couple indie's I'm looking at working on'. He becomes increasingly distracted as someone has clearly entered the room and the actor lends them his attention. We end on a middling note as I ask Michael where he sees himself in five years, though, in hindsight, it's more so a tranquil fervour. "Where do I see myself in five years' time?" he asks, again and again. "Where indeed? I don't know. On planet earth, sipping coffee." There's a long pause and then, he pointedly laughs. For much longer than expected.